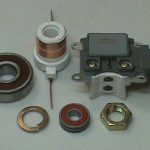 Have doubts about rebuilding your alternator? Not sure if your alternator is bad? Check out some important tips from the PROS!!! At rebuilderinabox, NOTHING is more important than quality assurance. For decades, we have dedicated ourselves to the the acquisition of superior quality starter and alternator components. And this is no easy task, as a result of our years of rebuilding experience, we have conquered the true significance of reliability and longevity. 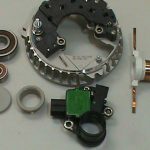 We will warranty all of our parts for the period of 1 year. But this is not an issue. If you follow our program, you will NOT have a warranty. You will NOT have to worry about it. 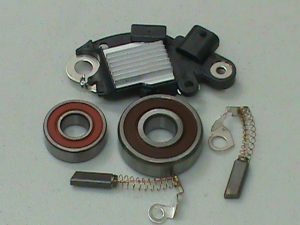 This alternator is the optional hi amp for many GM trucks and SUV models. You can easily recognize it by the large casting stamp in the aluminum front near the pulley. The black plastic cover on the back has multiple triangular holes. Also, the plug has 2 pins. It comes in 145 and 160 amp, but the kit is the same. Kit includes: 2 bearings, 2 brushes, new 4 pin voltage regulator. The parent company : Performance Starter & Alternator, Inc. has been in business since 1985. “Help” is what we’re all about. You don’t have to have any concerns whatsoever that your rebuild may not succeed. If you need help or have a question, e mail us. If you can’t understand the email, call us or leave a voice mail with your name and number. An actual starter alternator rebuilder will call you back. 1. We can fix the problem for you, test the unit to insure operation according to manufacturer’s spec’s, then send it back to you for a nominal fee. Of course, this price will be discussed before we do anything. And if if it’s something minor, we’ll probably fix it for free labor. 2. We can send it back to you, as is, for only the shipping charges, and you can have the satisfaction of doing the job right for yourself. 3. You can choose to bail and ask for a refund for the cost of the parts. 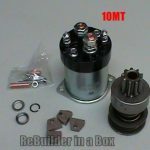 We at Rebuilder in a Box are accustomed to happy customers. Your successful rebuild is our success. All through the one year period of beta testing and interviews we maintained a 100% success rate and we have full intentions of maintaining that goal. So if you tend to be a little nervous…you don’t have to be. Our movies are so up close and thorough, our biggest criticizm is that we did “Too good of a job”. 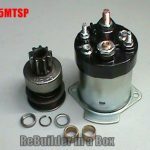 Alternator Starter Rebuild Kits © 2019. All Rights Reserved.